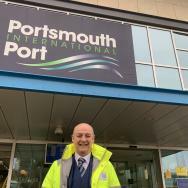 Experienced cruise specialist Ian Diaper joins Portsmouth International Port as head of operations, a new role created to manage shore side activity. Ian has spent over 40 years in the shipping industry, most recently as service delivery improvement manager for ABP Southampton. As head of operations Ian will be responsible for overseeing the delivery of all shore side activity, making sure cruise customer requirements are met, while also looking at opportunities for growth. Ian was one of the youngest captains on a British flagged vessel and has a significant experience of successful projects, including being part of the team who grew Southampton’s cruise calls to a record 500. Mike Sellers, Portsmouth International Port said: “We are delighted to welcome Ian to Portsmouth, he has impressive shipping experience and knowledge, and will be a vital contribution to our senior management team. Ian has worked both land and water side, providing experience across all marine activities including stakeholder planning, berthing, pilotage, stevedoring, as well as necessary health and safety requirements.